Light: Paying close attention. Helping others focus on the issue at hand. Getting everyone to work together. Identifying common ground. Bringing people together, despite their differences. Using reverse psychology. Shadow: Being distracted, or using your charms or skills to distract others from the goal. Calling attention to yourself with negative or unhealthy behaviors. Disrupting group activities as a means of feeding your own ego. Personality: The Queen of Wands can represent anyone who wants to convince others (Queen) to pursue a common goal (Wands), especially in academic, romantic, and professional areas of life. The Queen may also represent the tendency to be more manipulative than direct or the need to capture the attention of others. Story: The Main Character must persuade others to follow his or her lead. Relationships. Pull together a group of friends and organize a group date. If in an argument, make a special effort to see all sides. Refrain from thinking the issue at hand is “all about you.” Understand the motives of everyone involved, then go for common ground. Work. Progress is complicated by a lack of attention to details. Start from square one. Ask everyone involved to give a stamp of approval to the parts of a project they control. Get more people involved, and more people will be invested in the success of your project. Spirituality. A quiet mind is a sign of a focused spirit. When you’re feeling distracted, your spirit is pulled in every direction; when you’re focused, your energies flow naturally toward success. Take a deep breath, close your door, and invest a few minutes in calming yourself and your soul. Personal Growth. When you give someone your full and undivided attention, you give a rare and amazing gift. If you cultivate an ability to truly listen and respond, others will identify you as an intelligent, sensitive person they can trust with matters of real importance. Fortune Telling. This card represents a woman with an attractive, appealing personality, likely born between March 11th and April 20th, who wants to charm you into doing things her way. When? Between March 11th and April 20th. The Black Cat. The black cat on RWS-inspired versions of this card is a familiar, an animal helper sent to guard, assist, and protect. Having a “familiar”—an aide or openly or covertly embraces your ideology—in a group can help you steer participants toward agreement. Sunflowers. Sunflowers twist on their stems, following the course of the Sun through the sky. Are they devoting exclusive attention to the Sun, or does its light and warmth merely distract them from the world around them? Biases and Agendas. When pushed to cast your vote, be sure to know the biases and agendas of those who guide your collaborative efforts. The Marseilles Image. 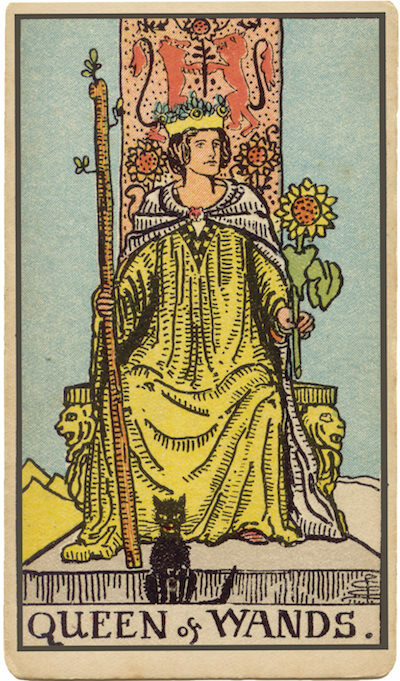 The Marseilles Queen of Wands looks sharply away, slouching in her throne — the picture of pure distraction. Still, her Wand is held at the ready. Should our attention wander from her, she’s liable to offer a gentle tap of correction. How can I draw people’s attention to what we have in common? To what extent am I able to convince people to do what I want them to do?